These Serpents sometimes grow to four times the Bigness of the Figure, are said not to be venomous, and are great Robbers of Hen-Roosts, sucking Eggs, tho' their Size seldom enables them to detour the Fowls. 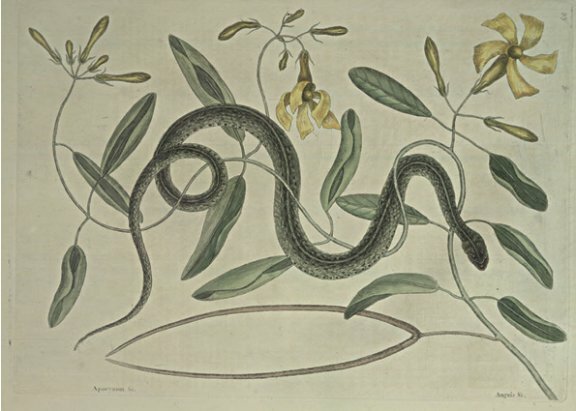 As the change of Marks and Colour in some Serpents cause Confusion in distinguishing them, I would willingly avoid Mistakes, by describing the same Snake twice, and multiplying the Kinds to more than there are: And I am diffident in determinating, whether this be a different Kind from the spotted Ribbon Snake, p. 51. Which somewhat resembles it, tho' of a different Colour. This Plant trails upon, and is supported by Trees and Shrubs to the Height often, and sometimes twenty Feet, the Leaves stand by Pairs on Footstalks an Inch long, shaped not unlike those of a Sallow, of a shining Green, and stiff, their Veins hardly discernable. These Leaves are apt to curl, or turn back as the Figure represents; the Flowers grow at the Ends of the smaller Branches, six or eight in a Cluster, on Footstalks above an inch long, are tubulous, having five Petals at the Mouth of the Tube, with broad square Ends. They resemble in Shape the Flowers of the Mangus. Hort. Malab. T. 39. The Seed-Vessels, as is usual in this Tribe, grow by Pairs, are eight or ten inches long, cylindrical and bend inwards, growing a little tapering towards their Points, which meet and touch one another exactly: The Colour of the whole Flower is yellow: The Pods when ripe discharge small flat milky Seeds, with white Down, like most other Apocynums. They grow on many of the Bahama Islands.